After earning third place in conference last year, the L-S girls cross-country team members have their eyes on gold after graduating three seniors from the team and bringing in five newcomers. The boys, on the other hand, are not big enough for a team yet, consisting of three runners, including returning senior Josh Dunsbergen. The Hawks’ first meet is at Williamsburg on Aug. 29. Darin Arkema is in his 15th season coaching L-S cross-country. Due to growing overall numbers, Chris Hansen was added as an assistant coach this year. Below is a Q-and-A with L-S Coach Arkema. Q: How is your team preparing for the season? 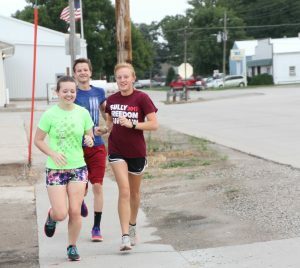 Running in downtown Sully Aug. 21 are Mary Kate Shaver, Joseph Anderson, and Abby Gruver. Through summer running and weightlifting sessions, hopefully, team members are entering the season ready to handle the workload and regular training each day. Some may be a little behind where they'd like to be, but just need to keep working, getting their bodies adapted at a pace they can handle. We’ve had two solid weeks of practice, getting into routines and establishing those practice and training habits that are going to help carry us through the season. Q: What strengths do you see in your team? How about areas to improve? A: Strengths: Numbers/depth with the girls' team, lot of experienced runners, good team dynamics – ready to work hard, push each other, and have fun. Concerns: Only three boys right now so missing the opportunity for team scoring; even though many are experienced, having run cross-country before, they are new to Lynnville-Sully, so finding out what they can do and find success; getting everyone on the same page to see just what is possible for them to accomplish if willing to do the things necessary. Q: What is the SICL looking like this season? Brittney Hansen checks the time while running with Ashton Thompson. A: Each year, our conference seems to produce some top runners in the state, and I expect nothing different this season. On the girls' side, Belle Plaine was conference champions last season, and I believe they will have a solid group back this year. Colfax-Mingo graduated Dakota after she led them during her four years, but I know they'll have a group that will contend, and they host the conference meet, which could prove an advantage for them. Sigourney was the 1A track champions and runner-up in softball, so their girls are competing at a high level right now. North Mahaska has a great runner in Cheyenne Shaw, so if they have anyone else to go with her, they could be there, along with Montezuma and BGM. Prior to last season, we were conference champions three years in a row and didn't like that streak ending, so I know the conference meet will be one our girls will be up for. Abby Gruver was all-conference as a freshman, and I think we can get some more to earn that honor this season. On the boys' side, Sigourney and then Belle Plaine were clearly the top programs last season. They each graduated a few, but I anticipate strong seasons from them again. With only three right now, we don't figure into the team race, but all three of our guys can take their talents and work themselves to being in the top 10 or 20 in the conference. And if we can convince two others to join them, then we take our chances in the team battle. Q: Do you have any other season outlook insights? A: I love the number of girls and the talent within that group that we have on the team. And even though it is just the three of them right now, the boys are each very capable runners that should expect a lot from themselves. Some individuals may be a little behind where we'd like to see them after summer coming into the season so we need to get them caught up. But I don't want them selling themselves short of what they can do. I want there to be a concentrated effort to do everything necessary as an individual so that each person is making the team stronger, and not because individually they want to accomplish things or receive accolades. When you give of yourself for the good of others or the group, you are the team member we want. I'm excited to see where we can go this season. It's certainly a fun group to work with.